Yay! They finally decided to put this in cans! 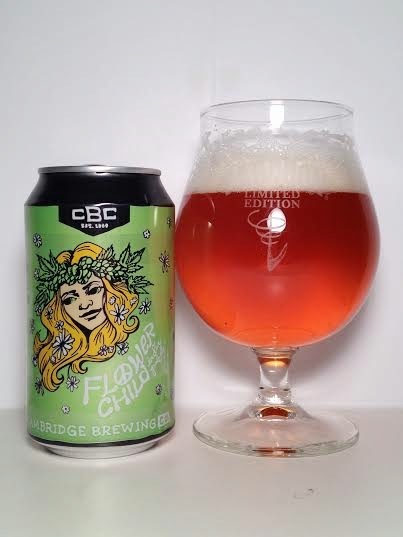 Boasting a murderer's row of hops, Flower Child promises to be a groovy experience. Ok, so my 60's repartee isn't up to par, but we're not here to see me talk. Pours a standard orange that is completely transparent. Produced a finger of white, soapy head. The aroma is pineapple and tropical fruits mixed with kind of a mossy, wet grass and dank hops. Flower Child delivers as promised on the taste with a bouquet of floral hops. There's a strong, grassy bitterness with a noticeable pine needle taste. Some hints of mango and orange are present on the finish, but this is earthy and herbal all the way. For as clean as it looks, it sure doesn't taste filtered as this is very flavorful. Carbonation comes up a bit short and it comes across thinner than I would like on the mouthfeel. With a lot of floral and grassy hops, I'm glad to say it finishes relatively clean with no unpleasant, lingering bitterness. There's also no detection of alcohol whatsoever. Flower Child is a solid, floral-driven IPA. There's plenty of delicious hop flavor with those herbal hops, but they don't bite back. Even with it's less-than-stellar mouthfeel, this has high drinkability and earthy goodness.